A great car, the 2018 Chevy Traverse should be at the top of the list for those in Portage, IN who are considering buying a car. 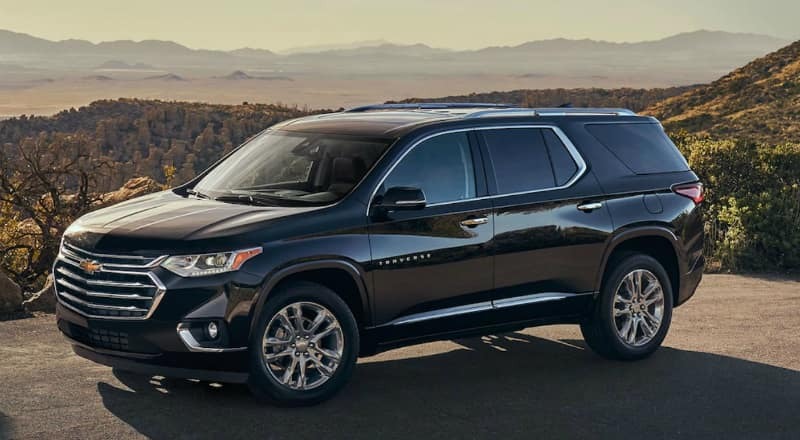 The 2018 Chevy Traverse has many features that give it an edge over all other cars in its category. We have highlighted some of these features that really stood out to us. These features include interior, exterior and tech features, the performance and cargo space, as well as the SUV’s value. The Traverse has been named the most dependable SUV. After looking at the sheer number of features it has, it is easy to see why. The performance of every vehicle is vastly dependent on its engine and the Traverse is no different. Its standard engine is the 3.6L V6 SIDI VVT engine with 9-speed automatic transmission. 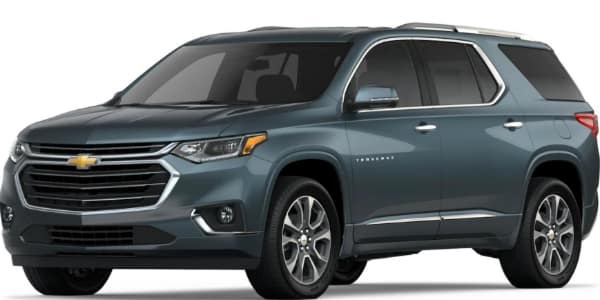 The Traverse is also extremely fuel efficient for a vehicle of its size and capability; giving a highway mileage of 25 mpg The Traverse’s engine has 310 horsepower and 266lb. ft. of torque. The Traverse runs very smoothly on multiple terrains thanks to its traction mode select option. It allows you to choose between FWD, 4×4/snow, tow/haul and off-road modes. The Traverse can also haul up to 5,000lbs, a feat that is unheard of in such SUVs. The safety technology of the Traverse has received a 5-star rating from the National Highway Traffic Safety Administration. After looking at the safety technology, it’s easy to see why. Some safety features of the 2018 Chevy Traverse include Surround Vision, Forward Collision Alert, Lane Keep Assist with Lane Departure Warning System, Adaptive Cruise Control, Rear Vision Camera, Front Pedestrian Braking, Teen Driver Technology, Rear Park Assist and many others. 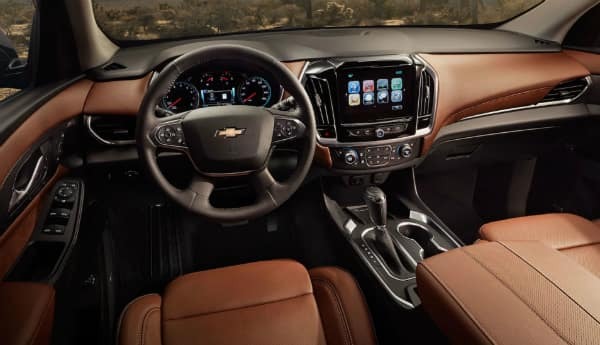 It also has lots infotainment tech such as 4G LTE WiFi, android auto, apple car play, Chevrolet Mobile AppChevrolet Mobile App, Bose Premium Speaker system, and Chevrolet My Link with 8” touchscreen with Navigation. The 2018 Chevy Traverse has a stunning interior. Extremely luxurious and spacious, the Traverse can easily seat 8 people. Even the passengers sitting in the rear seats will have more than enough legroom. Leather trimmings, Dual Sky-scape 2 panel sunroof, smart slide seating, and the noise-canceling cabin, add greatly to the Traverse’s appeal. It also has a humidity sensor, tri-zone automatic climate control, rear camera mirror, heated and ventilated seats, a heated steering wheel, wireless charging and a universal home remote. The sleek design and layout of the interior further add to the elegance of the car. Very few SUVs look as good as the 2018 Chevy Traverse. The combination of its looks and its exterior technology turn heads wherever the car goes. It also has a lot to boast about, from Intellibeam Headlamps, LED Daytime Running Lamps, 20” all season blackwall tires, upper and lower aero active shutters, fog lamps and many other features. The exterior of the 2018 Chevy Traverse is incomparable. In addition to all these great features, the 2018 Chevy Traverse also has a massive amount of cargo space. To be precise, the Traverse has 98.2 cubic feet of space, making it the best in class. Basically, no other SUV has as much or more cargo space than the Traverse. The car also has hands free gesture liftgate. If you are carrying valuables with you, you can keep these in the hidden storage compartment of the car. The compartment is also lockable.